Membership: Of the 100 members, only three were named, and all of those either quit or were killed. If beings are not mentioned as former members, then their status, they may still be alive and active. (Annihilation#2 (fb) - BTS / Annihilation#2: Centurions profile) - The Centurions were formed as an elite warrior force for Annihilus, one each from the 100 worlds under Annihilus' control. (Annihilation: Heralds of Galactus#2 (fb) - BTS) - The Centurions were the only keepers of order in chaotic realms. (Official Handbook of the Marvel Universe A to Z hardcover#2: Centurions profile) - The Centurions were looked on as heroes. Much like the heroes of Earth, they were a wildly diverse group and possess among them a variety of innate and artificial physical, mental, and otherworldly powers. (Annihilation#2: Centurions profile) - Annihilus convinced the Centurions and other Negative Zone inhabitants that the ever-expanding Earth dimension was on the verge of crushing the Negative Zone. (Official Handbook of the Marvel Universe A to Z hardcover#2: Centurions profile) - Annihilus did not reveal the far distant time frame of that death as its energies funneled away through myriad gravitational anomalies to power the expansion of the positive universe. (Official Handbook of the Marvel Universe A to Z hardcover#2: Centurions profile) -With the stated goal of setting this balance right, the worlds of the Negative Zone, and their heroes, put aside their differences and joined Annihilus. (Annihilation#2: Centurions profile) - Some worlds resisted Annihilus but were overwhelmed by the Annihilation Wave and eventually acquiesced. (Official Handbook of the Marvel Universe A to Z hardcover#2: Centurions profile) - This fate was undoubtedly concealed from most of the Centurions and remains so to this day. (Official Handbook of the Marvel Universe A to Z hardcover#2: Centurions profile) - The Centurions were scattered to different places as Annihilus’ Annihilation Wave forces were developed. (Official Handbook of the Marvel Universe A to Z hardcover#2: Centurions profile) - Presumably some members of the Centurions chose not to join Annihilus; they were undoubtedly slain or escaped, to be replaced by new Centurions. Some Centurions agreed to work with Annihilus only under threat of having their own families or even worlds destroyed. (Official Handbook of the Marvel Universe A to Z hardcover#2: Centurions profile) -When the Annihilation Wave entered the positive matter universe and swept across the Skrull and Kree worlds, Annihilus held the Centurions back, only using them individually and sporadically. (Annihilation#2 - BTS) - Annihilus deployed the Centurions as a united strike team against the United Front opposing him on Daedalus 5, a system on the periphery of the Kree Empire. 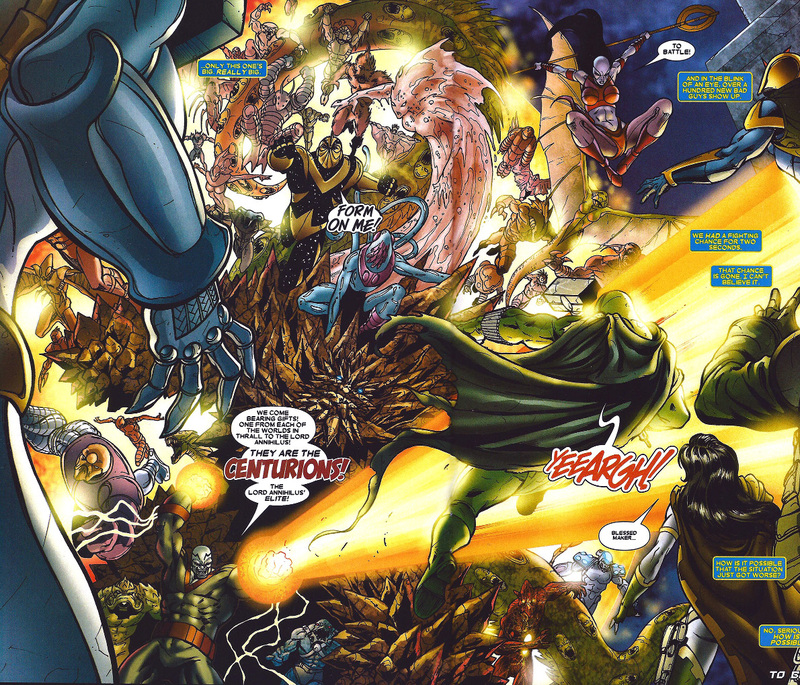 Led by Hybalea, the Centurions assault broke the back of the resisting forces, effectively ending the military phase of the war; in preparation to destroy Daedalus 5, Annihilus recalled the Centurions, and, seeing this, the surviving members of the United Front fled Deadalus 5, which Annihilus then destroyed via a weaponized Galactus. (Annihilation#5 - possibly BTS) - Some of the Centurions served Ravenous on Hala in a failed effort to drive off Ronan when he came for the House of Fiyero. (Annihilation: Heralds of Galactus#2 (fb) - BTS) - Following the defeat of Annihilus, the Annihilation Wave sued for truce, and the devastated leaders of the Kree and perhaps other Empires ceded numerous planets in the devastated Skrull Empire and a number of fringe territories still disputed by the Kree. Ravenous ruled over the ceded territories, and Centurions (the remnants of Annihilus' elite strike force) were each granted a world of their choice to set up their dominion. (Annihilation: Heralds of Galactus#2 (fb) - BTS) - The Centurions came to Canticle 8, presenting themselves as gods and playing ito the inhabitants' relatively primitive mind-set. (Annihilation: Heralds of Galactus#2 (fb) - BTS) - Warlord Smyt allegedly chose Omina Prime from among the many offered by Ravenous. (Annihilation: Heralds of Galactus#2 (fb) - BTS) - Firelord, a former herald of Galactus whose own planet, Xandar, had been among the first destroyed by the Annihilation Wave, refused to accept the terms of Ravenous’ truce and began traveling world to world, where he hunted down and killed five of the Centurion governors. (Official Handbook of the Marvel Universe A to Z hardcover#2: Centurions profile) - Some of the Centurions began to question their involvement in the destruction wrought by the Annihilation Wave and began leaving Ravenous. (Annihilation: Heralds of Galactus#2 (fb) - BTS / Official Handbook of the Marvel Universe A to Z hardcover#2: Centurions profile) - Ravenous set his own Centurion death squads against those Centurions who refused to serve him, killing at least three. The remaining rebellious Centurions, led by Hybalea, began to consider assassinating those who refused to leave Ravenous. (Annihilation: Heralds of Galactus#2 (fb) - BTS) - Firelord traveled to Canticle 8 and overpowered the unidentified Centurion now ruling it, as well as either defeating or slaying those aliens serving that Centurion. (Annihilation: Heralds of Galactus#2) - Firelord finished off the Centurion, tossed him to the ground, and left the Canticlans to return to their previous way of life. (Annihilation: Heralds of Galactus#2 (fb) - BTS) - Hybalea brought his renegade Centurions (Torrent, and six unidentified: bat-like, liquid, energized, mace-fisted, robotic, and tentacled) to Ominus Prime to take down Smyt, the Centurion ruling there. (Annihilation: Heralds of Galactus#2 (fb) - BTS) - A Centurion Death Squad (unidentified: cyclopean, visor, winged) was sent to Ominus Prime at the time of a reception being held in Smyt's honor. (Annihilation: Heralds of Galactus#2) - The Death Squad uncovered the renegades and joined Smyt in battling them, with Torrent and a robotic renegade swiftly falling in battle. As Smyt and the Death Squad threatened to overwhelm the renegades, Firelord arrived offered Smyt surrender or death. While Hybalea counseled all to stand down, Smyt rallied the Death Squad against Firelord, and all four were apparently slain by Firelord. Hybalea convinced Firelord to spare the renegades as they remained true to Centurions' original purpose; Firelord ordered them to target only Centurions still serving Ravenous and/or ruling worlds, or he would find and kill them. (Official Handbook of the Marvel Universe A to Z hardcover#2: Centurions profile - BTS) - Most Centurions remain loyal to Ravenous, while Hybalea continued to lead his small band in an attempt to reconstitute the Centurions on their old principles. (Official Handbook of the Marvel Universe A to Z hardcover#2: Centurions profile - BTS) - Presumably other Centurions still remain behind in the Negative Zone. With multiple factions scattered across two universes, the Centurions remained in a state of violent flux. Comments: Created by Keith Giffen and Andrea DeVito. Thanks to MarvelousLuke for another fantastic splice job of a two-page spread in the main image! She was present during the en masse assault on Daedalus 5. 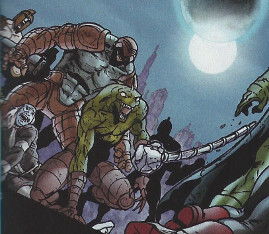 Some distance from the main battle, while Drax fought the enslaved Delinquent, she ambushed Drax, blasting him to the ground. As she descended to continue her attack, Drax bounded off a canyon wall and tackled her who swiftly attacked her in return. It is unclear whether she survived that battle and Daedalus 5' subsequent destruction. One would imagine Drax would have killed her given the chance. 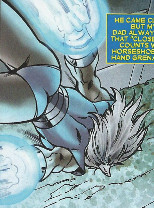 She could project concussive force from her hands, which she could also use to direct her in flight. 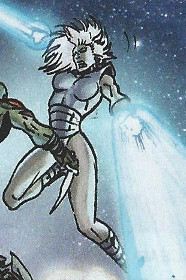 Her ears, general appearance, and hand blasts, plus the fact that she was from the Negative Zone, make it seem most likely that she is a Baluurian, like Blastaar. The energized Centurion who was later part of the renegades is clearly recognizable to the left projecting energy from both hands into a plasma/lightning-like ball. We also see former Galactus heralds Red Shift (left) and Stardust (right) slaying several opponents, presumably Centurions. I don't think anyone other than the three ones named above is recognizable. Looks like a few Centurions may have been killed in thie scene. Phyla is blasting a hole through some opponent, possibly a Centurion; completely shadowed, this being's only distinguishing features are/were two fingers (although we could just be catching the hand in some oblique fashion, and there could be a thumb or something else hidden) and what looks to be relatively long hair (I suppose it could be some weird beak...). Nova is smashing some red, potentially rock-like guy with spikes for hands into an even bigger, gray, also possibly-rock-like guy. Nova also seems to be holding some other guy in tow. The person appears to be a biped, possibly with 3-4 digits on the hands. There's some reptillian-looking thing in the background behind the guy Nova is dragging. It may a Centurion or part of the Annihilation Wave. This scene immediately follows the one above. Again, centrally, we see Quill and Phyla. 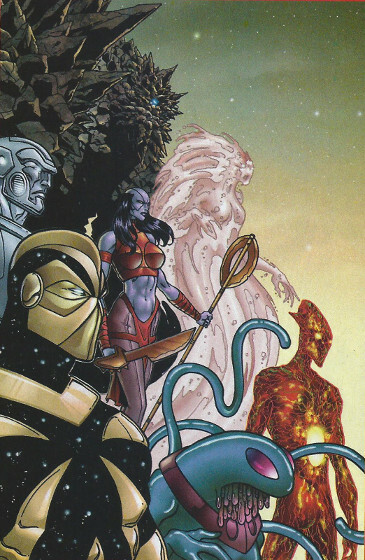 On the far right, we see Nova carrying one or two beings. All that's really recognizable is a unique-looking (possibly insectoid) lower leg; maybe this is a member of the Centurions (it may be the person he is towing in the panel above), or possibly this is a part of the Annihilation Wave. On the left, we see a four-armed (with two fingers per hand), hairly being, possibly with elongated ears like a wolf. He looks to have been torn completely in half at the waist by Nova. He is clearly seen in the assault on the United Front on Daedalus 5 (over Hybalea's right shoulder). A group of Centurions accompanied Ravenous to Hala when he met with the House of Fiyero. When Ronan, Super-Skrull, and Praxagora stormed House Fiyero (who had formed a peace treaty with the Annihilation Wave), the Centurions met them in battle. 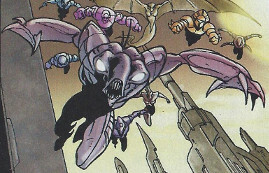 As the heroes battled Kree soldiers, a large, armored insectoid being flew down and tackled the Super-Skrull. 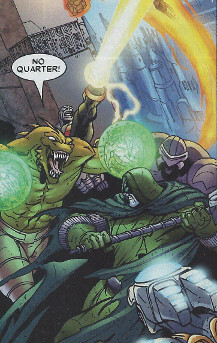 Kl'rt countered by punching him back, after which Ronan released an energy burst that dropped the first wave of Centurions. By Super-Skrull's left elbow, someone non-Kree (presumably a Centurion) seems to be rushing towards Kl'rt, but all we can really tell is the character is a biped. 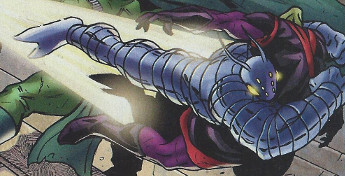 Under Super-Skrull's right elbow, we see the face of some being with an elongated head that tapers to a point around the mouth, from which protruded sharp teeth. There also looks to be some pointy projections from the sides of the top head. This guy is the bulky guy seen above the right elbow of the sharp-tooth guy in the next sub-profile. And, to that guy's right, there's the sharp-toothed-insectoid being pictured below. Both of these characters are blown away when Ronan releases the energy burst. This guy (and those behind him/her/it) were among the Centurions accompanying Ravenous to Hala when he met with the House of Fiyero. Flying down to confront Ronan, Super-Skrull, and Praxagora, this guy was preparing to engage Ronan (as seen in the top right of the right image above) when Ronan unleashed a burst of energy that stunned the attacking Centurions. He can be seen being knocked back by Ronan's energy blast at the forefront (to the right) of the image to the right. These all the rest of the first wave were stunned by Ronan's energy blast (seen in the image on the right). They remained close by Ravenous and did not oppose Ronan, Super-Skrull, and Praxagora as they approched the House of Fiyero. As soon as Super-Skrull assaulted Ravenous, these two rushed in and confronted Ronan. Ronan punched back the lizard guy, but he continued fighting. When Ronan dropped Ravenous, these two watched in stunned shock and then surrendered, leaving the House of Fiyero to Ronan's not-so-tender mercies. The lizard guy could make his hands glow with green energy, but the nature of this energy and its effects are unrevealed. The other guy was not seen in combat that I could see. He looked to be strong and durable.